Hong Kong as the most cosmopolitan city with a varied population of expats and professionals from all over the globe always is in need of skilled domestic helpers capable of taking care of every different household needs. Young professionals who just became parents or young citizens with nobody to take care of their little ones when they are not around always need domestic help to attend their kids. In many cases, nannies who are hired to take care of the kids are actually child care specialists having sound experience and proven expertise in offering highly personalised care to the kids at home. But professional experience and skills are alone not enough to take proper care of the kids at home. They also need to have a caring and benevolent personality. It is also up to them to give children their first teaching on orderly and disciplined living. Typically domestic helpers need to have some personality attributes and qualities that help them to understand the children’s needs and address them in a proper way. Apart from these personality attributes and qualities if they have some prior training in nursing and child care, it can be considered as additional qualities to their professional portfolio as caregivers. Some of the day to day tasks that domestic helpers need to perform as part of their responsibility to take care of children include cooking, feeding babies and kids, cleaning clothes and baby essentials, keeping baby or nursery rooms in good shape, playing with the babies and kids, handling demands of children with caring words, putting babies and kids to sleep, etc. Considering all these challenges and requirements, we have come here with 10 qualities and skills domestic helpers invariably need to take care of the children at home. Unlike the grownup children need constant care and love. They always look for some helping hands whenever facing any challenging situation or trouble. Without someone to look after their needs, they find themselves helpless and unhappy. This is why for busy parents it is extremely essential to employ expert domestic helpers to fulfill their absence. But, when fulfilling the absence of parental care the domestic help needs to be endowed with similar caring qualities and personality traits. Children are supposed to be frantic and restless and to appease them from time to time one needs to have enough wit. Though a degree and diploma in child care is not alone enough and does not guarantee proper care for the kids in real life, such qualification will prove invaluable as far as building skills and efficiency are considered. Apart from the so called academic training and exposure to child care, if the domestic helper has years of experience in taking care of children and babies, this will make them even more equipped for such job. A bit of exposure and experience in teaching kids will also add to their credentials. Just think of a situation when your little kid had a minor bruise on his limbs and is crying in pain. If you are not around at that point of time, can the domestic helper just administer some topical medicines and can she give a comfortable bandage around the bleeding spot? If yes, she is versed with the skills for primary medical care and first aid. Efficiency to administer first aid treatment to the kids following minor accidents is a necessary quality every domestic helper must have. Well, this is rather a creative quality that hardly you can expect from every domestic helper. Can the lady working as domestic helper is communicating with your kid in a lovingly creative way? Can she tell your kid a story that forces the little one to keep silent for a little while? While such qualities are rare and far from the everywhere phenomenon, at least clear communication is something you can look for in the nanny you employ at home. Checking the background of the domestic helpers is one of the necessary prerequisites for any homeowner. In a highly cosmopolitan city like Hong Kong where people from neighboring countries arrive regularly in search of odd jobs, knowing the person you employ as a domestic help is most crucial to ensure safety for your family. Apart from regular background check one also needs to ensure that the domestic help comes from a good family and has experience in dealing with kids. Children at any home are known for their frantic and restless behaviour, and they often become stubborn with their demands. Moreover, mischievous and naughty kids often prove really challenging for the family members and maids to deal with them. In certain crisis situations like a breakout of fire, major accidents and any other emergency when one needs to safeguard children and keep them out of anxiety, the aptitude and presence of mind of the domestic help can really come handy and useful. Patience may be a rare phenomenon among most people but when it comes to the responsibility of taking care of little children, it is a must have quality. A nanny should understand the kids better than any other at home as they live close to them for the most part of the day and night. But to achieve such understanding, they first of all need to be good listener. When a domestic helper needs to stay at home with the kids, she must have at least some working skills to cook and prepare food for the babies and kids. Little members of the family, most of the times, are moody and detest taking foods that do not make their taste buds tingle. So, if the nanny can cook tasty foods liked by your kids, you can really find it great. Even if she doesn’t know cooking delectable dishes, ability to prepare some quick baby foods and stuff that children like can be a great help as well. Kids most of the time have the uncanny knack of messing with things around and leaving everything in a severely unorganized shape. With their seemingly inexhaustible energy and restless limbs such exuberant chaos is quite expected, and hardly we can mend their ways to meet our demands of neatness. But that is when nannies and domestic helpers can really play an important role. They can always put things in order and from time to time organize the kid’s room by placing things where they should belong to. Finally, the responsibility of maidservants and domestic helpers just do not end up with apparent care for the kids. Often when other people at home become absent leaving her a lot of other things to do, her additional skills with other tasks are put to the test. At times they need to wash clothes, clean the floor and also need to take the little children to the local park for a quick stroll. 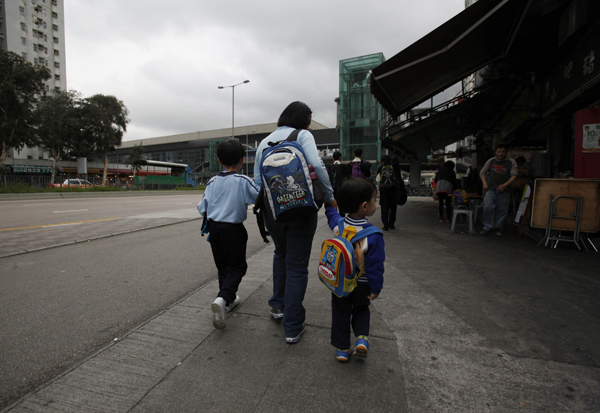 To conclude, if you need a domestic helper in Hong Kong expressly for looking after your kids and babies at home, it is advisable not to compromise on the above mentioned qualities and skills. At least, you should make sure they have a majority of these at their command. Edouard Muller is a French entrepreneur working in the Hive Sai Kung. He is the founder of HelperPlace – a leading platform to find the right domestic helper in Hong Kong.